Arab League leaders have called for the immediate implementation of a joint plan with the UN to end a year of violence in Syria. Syria's President Bashar al-Assad has accepted the plan, state media report, but says "terrorism" must stop as well. Earlier, Iraq's PM Nouri al-Maliki warned that arming either side in Syria would lead to a "proxy war". He was speaking at the opening of an Arab League summit in Baghdad - the first such meeting there for decades. President Assad's remarks were contained in a message to the world's emerging powers - Brazil, Russia, India, China and South Africa - who met in Delhi on Thursday. He said he would work to enforce the peace plan but "terrorism" must stop as well, state news agency Sana reported. The Syrian government blames the anti-government uprising on foreign-backed terrorists and armed criminal gangs. The UN-Arab League plan, brokered by envoy Kofi Annan, would see a UN-monitored end to fighting, troops pulled out of opposition areas and access for humanitarian services. Syria first agreed to the initiative on Tuesday but violence has continued. 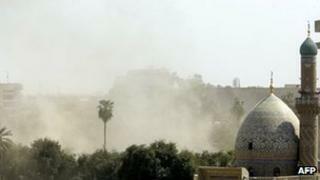 A number of explosions were heard in central Baghdad as the summit was getting under way. Two of the blasts occurred near the Iranian embassy, eyewitnesses said. There were unconfirmed reports that an explosion near the city's secure Green Zone was an IED (improvised explosive device). Fewer than half the Arab League's 22 heads of state turned up for the summit, reflecting their suspicion of Iraq's government and its close ties to non-Arab Iran. Iran is also Syria's closest ally in the Middle East. "Based on our experience in Iraq, the option to arm either side of the conflict will lead to a regional and international proxy war in Syria," Mr Maliki said. The Emir of Kuwait attended the summit - the first visit by a Kuwaiti leader to Baghdad since Kuwait was invaded by Iraq under Saddam Hussein in August 1990. Qatar and Saudi Arabia, the two Arab states most fiercely opposed to the Syrian government, only sent envoys. The summit was held in such tight security at the city's former Republican Palace that the venue was not initially disclosed to journalists. While expectations were not high for the talks, the fact that they were being held in the Iraqi capital at all can be seen as a sign of progress for Iraq, says the BBC's Wyre Davies, in Baghdad. UN Secretary General Ban Ki-moon urged Syria "to put commitments into immediate effect". "The world is waiting for commitments to be translated into action. The key here is implementation: there is no time to waste," Mr Ban told the summit. The UKwill give £500,000 ($795,000)to Syrian opposition groups, Foreign Secretary William Hague is to announce later on Thursday. The money will be used for "practical non-lethal support" and to document human rights abuses by the Syrian government, Mr Hague will say in a speech in London. Both Qatar and Saudi Arabia have voiced their support for arming opposition forces in Syria, and some analysts believe they are already funnelling weapons to the rebels. Washington has urged countries to maintain pressure on the Syrian government. The US state department said it had "not seen the promises that Assad made implemented". The opposition in Syria is sceptical about the terms of Mr Annan's plan, with some saying Mr Assad is merely stalling for time in order to continue his crackdown. "We are not sure if it's political manoeuvring or a sincere act," said Louay Safi, a member of the opposition Syrian National Council. "We have no trust in the current regime... We have to see that they have stopped killing civilians." The UN says more than 9,000 people have been killed during the year-long Syrian revolt.